The Departments of Physics and Mathematics at Brandeis University are incredibly excited to announce that this year’s Eisenbud Lectures in Mathematics and Physics will be given Prof. James P. Sethna, a theoretical physicist whose work has often carved out new directions in condensed matter physics, in its broadest interpretation. Prof. Sethna has tackled traditional and highly non-traditional topics in Physics. The title of one of his recent talks is “The Statistical Mechanics of Zombies”!. “Mosh Pit Dynamics at Heavy Metal Concerts” is another example where Jim uses the tools of statistical mechanics to understand a social phenomenon. Jim is a fascinating speaker, and these lectures promise to be enlightening and entertaining in equal measure. His playful enthusiasm for science is certain to draw you in. So, try not to miss this year’s series of three Eisenbud Lectures. The first lecture on Monday, November 27 will be on “Sloppy models, Differential geometry, and How Science Works”, and is intended for a general science audience. This lecture will be held in Gerstenzang 121 at 4 PM. 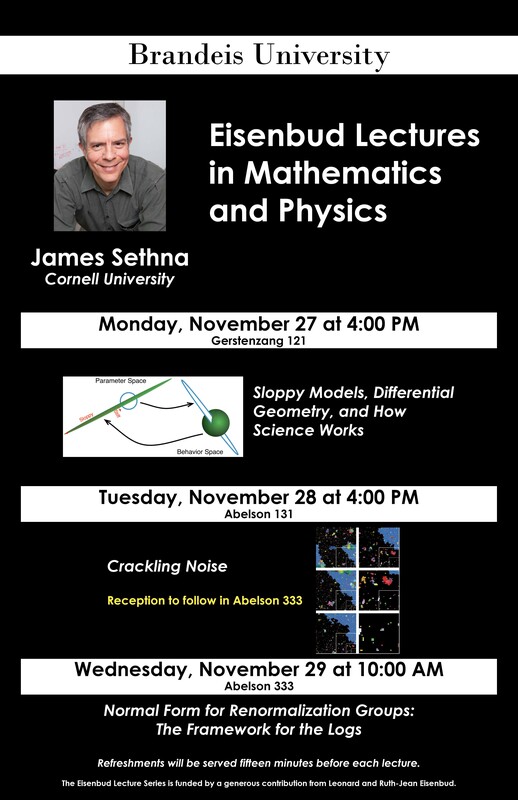 The second lecture on Tuesday, November 28 will be a colloquium-style lecture entitled “Crackling Noise” and will take place in Abelson 131 at 4 PM. The final lecture, “Normal form for renormalization groups: The framework for the logs” will be delivered at 10 AM on Wednesday, November 29 in Abelson 333. Refreshments will be served 15 minutes prior to each talk. There will be a reception in Abelson 333 following Tuesday’s talk. Additional information is available on the lecture’s website. We hope to see you all at what promises to be an exciting series of talks! This year’s Eisenbud Lectures in Mathematics and Physics will be given by Dr. Jennifer Chayes, Distinguished Scientist and Managing Director of Microsoft Research New England. Dr. Chayes is well known for her work on the phase transitions in combinatorial and computer science problems; she is a world expert on the study of random, dynamically growing graphs, which can be used to model real-world social and technological networks. Dr. Chayes received her PhD in mathematical physics from Princeton. After postdoctoral fellowships at Harvard and Cornell, she was on the faculty at UC Los Angeles before co-founding the theory group at Microsoft Research in Redmond, Washington. In 2008 she co-founded Microsoft Research New England. She is a fellow of the American Association for the Advancement of Science, the Fields Institute, and the Association for Computing Machinery; she is also a National Associate of the National Academies. 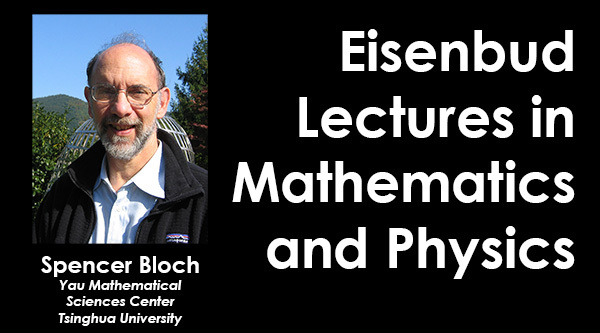 The Eisenbud Lectures are the result of a generous donation by Leonard and Ruth-Jean Eisenbud, intended for a yearly set of lectures by an eminent physicist or mathematician working close to the interface of the two subjects. Dr. Chayes’ distinguished career working on fundamental issues in mathematics, physics, and computer science makes her an ideal speaker for this series. The lectures will take place at 4 PM on Tuesday Nov. 29 and at 4:30 PM on Thursday Dec. 1. both in Abelson 131. A full description of the lectures can be found below. Driving directions, maps, links to the MBTA, and so forth can be found at: http://www.brandeis.edu/about/visiting/directions.html. If you need parking, please contact Catherine Broderick at cbroderi@brandeis.edu. A reception will be held after the first lecture on Tuesday November 29th from 5pm – 7pm in the Faculty Club Lounge at Brandeis. All are welcome. Everybody should come out to hear this year’s lectures! They promise to be a lot of fun. During the past decade, dynamic random networks have become increasingly important in communication and information technology. Vast, self-engineered networks, like the Internet, the World Wide Web, and online social networks, have facilitated the flow of information, and served as media for social and economic interaction. I will discuss both the mathematical challenges and opportunities that exist in describing these networks: How do we model these networks – taking into account both observed features and incentives? What processes occur on these networks, again motivated by strategic interactions and incentives, and how can we influence or control these processes? What algorithms can we construct on these networks to make them more valuable to the participants? In this talk, I will review the general classes of mathematical problems which arise on these networks, and present a few results which take into account mathematical, computer science and economic considerations. I will also present a general theory of limits of sequences of networks, and discuss what this theory may tell us about dynamically growing networks. Although the Internet, the World Wide Web and online social networks have many distinct features, all have a self-organized structure, rather than the engineered architecture of previous networks, such as phone or transportation systems. As a consequence of this self-organization, these networks have a host of properties which differ from those encountered in engineered structures: a broad “power-law” distribution of connections (so-called “scale-invariance”), short paths between two given points (so-called “small world phenomena” like “six degrees of separation”), strong clustering (leading to so-called “communities and subcultures”), robustness to random errors, but vulnerability to malicious attack, etc. During this lecture, I will first review some of the distinguishing observed features of these networks, and then discuss some of the models which have been devised to explain these features. I will also discuss processes and algorithms on these networks, focusing on a few particular examples. In the second lecture of this series, I will abstract some of the lessons of the first lecture. Inspired by dynamically growing networks, I will ask how we can characterize general sequences of graphs in which the number of nodes grows without bound. In particular, I will define various natural notions of convergence for a sequence of graphs, and show that, in the case of dense graphs and even some sparse graphs, many of these notions are equivalent. I will also give a construction for a function representing the limit of a sequence of graphs. I’ll review examples of some simple growing network models, and illustrate the corresponding limit functions. I will also discuss the relationship between these convergent sequences and some notions from mathematical statistical physics.